One Pair of Shoulder Pads. Length from top of shoulder – 19½ ins. To get these measurements it is absolutely necessary to work at a tension to produce 2 patterns to 2½ inches in width. Using No. 10 Needles, cast on 50 stitches. 1st row: * K1, P1, repeat from * to last 2 sts, K2 . Repeat 1st row twenty-nine times. 1st row: K1, P1, * K2, P2, repeat from * to last 8 sts, (K1, P1) three times, K2. 2nd row: (K1, P1) four times,* K2 , P2, repeat from * to last 2 sts, K2. Repeat 1st and 2nd rows twice. ** 1st row: K1, P1, * slip next 4 sts on to a spare needle, and hold at back of work, K2, then P2, K2 from spare needle (working of these 6 sts will now be termed “Twist,” throughout) (P2, K2) twice, P2, repeat from * to last 16 sts, “Twist,” P2, (K1, P1) three times, K2. 2nd row: (K1, P1) four times,* K2, P2, repeat from * to last 2 sts, K2. 3rd row: K1, P1, * K2, P2, repeat from * to last 8 sts, (K1, P1) three times, K2. Repeat 2nd and 3rd rows once, then 2nd row once. 7th row: K1, P1, (K2, P2) twice, * “Twist,” (P2, K2) twice, P2, repeat from * to last 8 sts, (K1, P1) three times, K2. Continue in pattern, as given from ** to **, increasing once at beginning of needle in next and every following 8th row, until there are 55 sts on needle (working extra sts in purl fabric). Work 7 rows in pattern, without shaping. Cast off 7 sts at beginning of next row, then decrease once at beginning of needle in every alternate row, until 41 sts remain. Work 19 rows in pattern without shaping. In next row, work 31 sts in pattern, turn, leave remaining 10 sts on a spare needle. Continue in pattern, decreasing once at neck edge in every row, six times (25 sts), then decrease once at neck edge in next and every alternate row, until 22 sts remain. Work 1 row without shaping. 1st row: Work in pattern to last 7 sts, turn. 2nd and 4th rows: Work in pattern to end of row. 3rd row: Work in pattern to last 14 sts, turn. 5th row: Like 2nd row. Cast off. 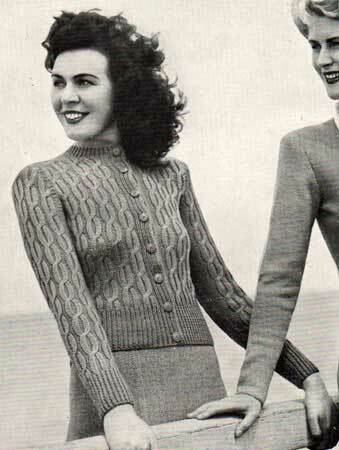 Work to correspond with Left Front, working border and shapings at opposite ends of needle and making a button-hole in 5th and 6th and every following 17th and 18th rows six times (7 buttonholes). 1st row: K2, P1, K1, cast off 2 sts, work to end of row. 2nd row: Work to last 4 sts, cast on 2 sts, (P1, K1) twice. Using No. 10 Needles, cast on 90 stitches. 1st row: K1, P1, * K2, P2, repeat from * to last 4 sts, K2, P1, K1. 2nd row: K2, * P2, K2, repeat from * to end of row. ** 1st row: K1, P1, * “Twist,” (P2, K2) twice, P2, repeat from * to last 8 sts, “Twist,” P1, K1. 3rd row: K1, P1, * K2, P2, repeat from * to last 4 sts, K2, P1, K1. 7th row: K1, P1, (K2, P2) twice, * “Twist,” (P2, K2) twice, P2, repeat from * to last 16 sts, “Twist,” (P2, K2) twice, P1, K1. Continue in pattern as given from ** to **, increasing once at each end of needle in next and every following 8th row, until there are 100 sts on needle (working extra sts in purl fabric). Work 7 rows in pattern without shaping. Cast off 7 sts at beginning of each of next 2 rows, then decrease once at each end of needle in next and every alternate row, until 72 sts remain. Continue in pattern without shaping until arm-holes measure same as Front arm-holes. 1st and 2nd rows: Work in pattern to last 7 sts, turn. 3rd and 4th rows: Work in pattern to last 14 sts, turn. 7th row: Work in pattern to end of row. Cast off. Repeat 1st row twenty-three times. ** 1st row: K1, P1, * “Twist,” (P2, K2) twice P2, repeat from * to last 16 sts, “Twist,” (P2, K2) twice, P1, K1. 7th row: K1, P1, (K2, P2) twice, * “Twist,” (P2, K2) twice, P2, repeat from * to last 8 sts, “Twist,” P1, K1. Continue in pattern, as given from ** to **, increasing once at each end of needle in next and every following 8th row, until there are 70 sts on needle (working extra sts in purl fabric). Continue in pattern without shaping, until work measures 17½ ins. (or length desired) from commencement. Cast off 2 sts at beginning of each of next 2 rows, then decrease once at each end of needle in next and even alternate row, until 24 sts remain. 1st row: * K1, P1, repeat from * to last st K1. Work 6 rows in rib, making a button-hole as before in 3rd and 4th rows. Sew in sleeves, placing seam to seam. Sew shoulder pads in position. Sew on buttons to correspond with button-holes. The original publication of this pattern is in the public domain, however this digitalL version with updated language is copyright Sarah Bradberry, August 2nd 2012. All rights reserved.